A 40-year recording career – an extraordinary milestone by any measure. 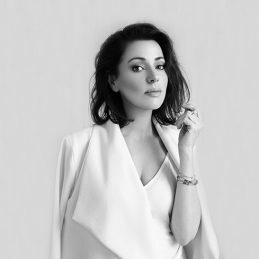 But consider this: Tina Arena is the only Australian artist to earn a gold or platinum certification for original album releases, in every decade since the 1970s, right through to now. In fact, every album in her career has gone gold, platinum or multi-platinum. Her 1994 album “Don’t Ask” remains one of the highest selling Australian albums of all time, currently certified 14 X platinum. Add to this her unprecedented success in France – she’s sold 5 million albums there alone. Tina’s journey is, of course, the stuff of Oz music folklore, dating right back to mid-’70s when all of Australia knew her simply as “Tiny Tina”, arguably the most popular singer in the country … by age nine! Tina’s debut studio recording, 1977’s Tiny Tina & Little John (co-starring John Bowles, her 12-year-old cohort from the legendary variety TV show Young Talent Time) had Tiny Tina belting out pitch-perfect covers of chart hits of the time such as ABBA’s “Ring Ring” and “When I Kissed The Teacher”. The album cover had a picture of Tiny Tina holding Little John’s hand and cuddling a teddy bear. Needless to say, generations of Australians have grown up with Tina Arena and her music ever since then. The child star matured into one of our most successful singer/songwriters, the possessor of a voice for the ages, and she’s now a veteran (even though she’s still only in her 40s! ), with total album sales topping 10 million. We all feel like we’ve known Tina our whole lives – the diva herself has certainly never hid her feelings from us – so it won’t surprise anyone that, Tina being Tina, she was never going to let an occasion like her 40th anniversary be marked by a straight-forward greatest hits set. While the star herself has always been forward-focused with her music and career, undoubtedly producing some of her finest original new music in this current decade, the 40-year milestone – alongside other recent awards and accolades such as 2015’s induction into the ARIA Hall Of Fame and 2016’s Order of Australia medal – has forced Tina to pause and reflect. And looking back, Tina couldn’t be prouder of everything she’s survived and achieved thus far.